Hair wings for wet flies can be made from body or tail hair from many different animals, in a wide variety of colors, lengths and thicknesses. 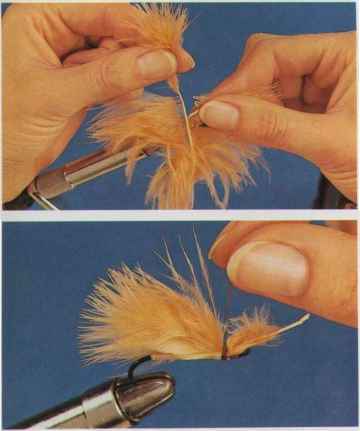 The following sequence of photographs shows how to tie on a deer-hair wing as used in the Improved Governor steelhead fly; the same technique is suitable for all other wet-fly hair wings. 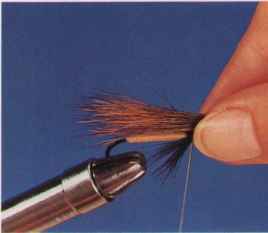 To enable the wing to lie close to the body, cut off the top few hackle fibers, as shown. Cut, prepare, and match the ends of a bunch of hair (in the same way as described for "Hair Tails" in Chapter 3). Deer-tail hair is used for the wing of the Improved Governor. I find turkey marabou a delight to use, because it is soft, clean and easy to tie. A marabou wing has a lively and attractive action when fished, making it highly effective for many kinds of wet flies. Marabou wings may be tied in single or mixed colors. They may also be tied in conjunction with hair or peacock herls. T • Form the body, including any hackle required. (S). To prepare the marabou plume, first hold, in your left hand, all those fibers that are aligned evenly at the top. Next pull off all the other fibers, as shown. The surplus fibers, when matched at the tips, can be tied on as a bunch (or bunches) to provide further wings. Prepare as many marabou plumes as required. Place the hair wing on top of the body, with the tips of the hair fibers pointing back over the hook bend, and check the wing proportions. Holding the hair wing in your left hand, use the dubbing needle to work glue thoroughly into the fibers where the wing will be tied on. Trim off the surplus in layers, tapering toward the hook eye. If desired, glue the surplus also; then wind on the final tying thread turns and finish off the fly. How to tie a deer hair wings?